With almost 40 years of aggressively representing injured clients throughout New York City, Belovin Franzblau & Associates is proud to have Jeffrey J. Belovin, of counsel to our firm, and as a consultant. Mr. Belovin is a past President of the Bronx County Bar Association and was the Chairperson for Continuing Legal Education for the Bronx County Bar Association. 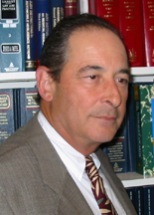 His past and/or present affiliations include the New York State Trial Lawyers Association, Association of the Bar of the City of New York, American Trial Lawyers Association and the New York State Bar Association. Mr. Belovin is also admitted to the highest Court in the land, the United States Supreme Court. He has also published “Venue – The Transitory Action Syndrome Advocate” and “Code, Rule and Regulations as Evidence Advocate” in the Bronx County Bar Journal. Mr. Belovin continues to offer sage advice and wisdom to our attorneys as we strive to protect your rights and fight for you every step of the way. To speak with or set up an appointment with attorneys at Belovin Franzblau & Associates, P.C., call us at (718) 655-2000 or (718) 655-2900.